SUCCESSFUL OUTREACH: 2018 FED UP! 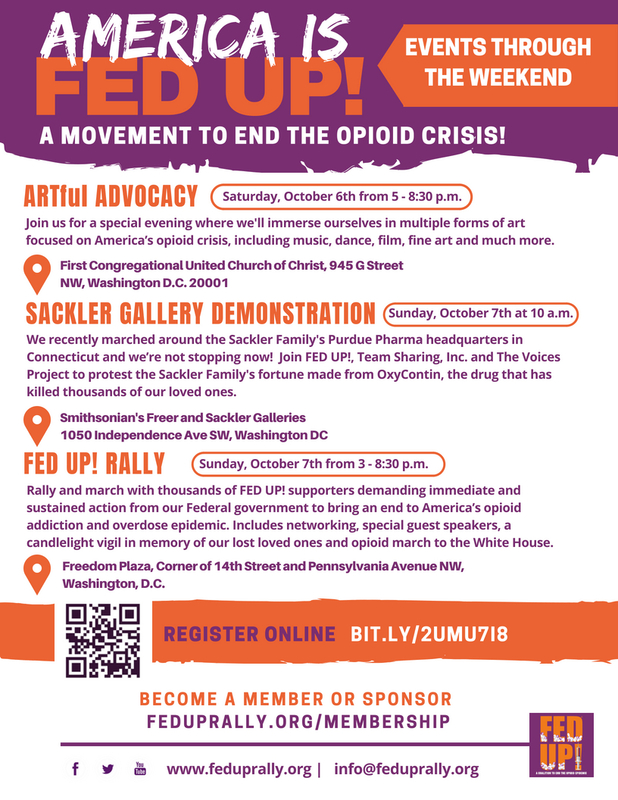 Rally, #OpioidMarch and Artful Advocacy Event - FedUp! Held in Washington, D.C., the FED UP! Coalition held our 6th annual FED UP! Rally and our first Artful Advocacy event to bring awareness to the need for action NOW!! For almost a decade, the FED UP! Coalition has been unifying families, organizations, and allies from across our nation who’ve stood together in an alliance to end the opioid epidemic. With another year of increased deaths, there is still much work to be done in 2019 and beyond. We’re STILL FED UP! and we’re continuing to call for immediate, coordinated and comprehensive federal action to end the epidemic of addiction and overdose deaths attributed to opioids. The FED UP! Coalition does not, and will never, collect funds from pharmaceutical companies or the trade organizations lobbying on their behalf. WHAT: A special evening where we immersed ourselves in multiple forms of art focused on America’s opioid crisis, including art, music, dance and film. HELD: Sunday, October 7, 2018 at 10 a.m.
WHAT: We recently marched around the Sackler Family’s Purdue Pharma headquarters in Connecticut and we’re not stopping now! Many joined FED UP!, Team Sharing, Inc. and The Voices Project to protest the Sackler Family’s fortune made from OxyContin, the drug that has killed thousands of our loved ones. Afterwards, we continued our events for the day at the FED UP! Rally in Freedom Plaza. WHERE: 2018 RALLY was held at Freedom Plaza, Corner of 14th Street and Pennsylvania Avenue NW, Washington, D.C. Learn about our past events and read our platform. Plans are again underway to help our members and partners create International Overdose Awareness Day events in their communities. View the flyer here. Please contact Emily Walden at emilywalden@feduprally.org to ask about a FED UP! International Overdose Awareness Day event in your area … or offer to plan one using our FED UP! Rally Planning Toolkit which contains everything you would need to know.